Uniform roller racking is designed to store uniforms in stores before issuing and our system can be designed to suit your requirements. We can accomodate the full range of clothing from great coats to tunics and trousers, all stored secure on the roller racking. The uniform mobile shelving also enables other items such as hats or helments to be stored along side the clothing so as to provide a complete stores envoirnment. 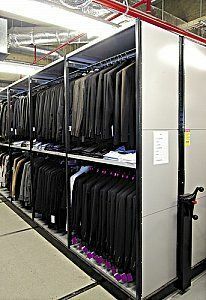 We can design the system to accomodate the space available and the types of uniforms or clothing you wish to store.